Share your time with a native who is fully knowledgeable about the history and culture of Switzerland and is also able to enrich your visit by explaining our way of life and by entertaining you with personal anecdotes. Let me be your personal travel guide. Join me, as I show you my beautiful home town. 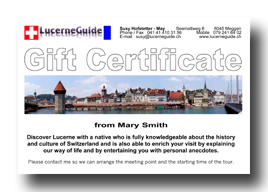 Explore Lucerne (Luzern) on foot with a native and learn important humorous and interesting facts about Lucerne's history, churches, bridges, narrow streets, towers, squares, and of course, Lucerne's trademarks, the Chapel Bridge with Water Tower and the Lion Monument. You determine the meeting point, the starting time and the duration of the tour.
. . . and many other destinations. Excursions from Lucerne - operated by "Best of Switzerland Tours"
for a Private Guided City Walk! ** Meal allowance: CHF 30 extra. Any cancellations within 24 hours or no-show are subject to a full charge of the tour cost. "Last Monday I had the pleasure of meeting you and enjoying the best city tour I have experienced in my 29 years of taking groups to Europe. I want to thank you for taking the extra time to take us to the residential section and to that beautiful park overlooking the city. Your knowledge and your love for the city were very apparent as you gave us the tour and answered our questions. You'll recall that I mentioned to you my interest in having local guides while we are in Switzerland, with the possibility of your traveling with us for those few days next summer? I can think of nobody more qualified - no one with whom I would rather work than you. ( . . . ) Again, Suzy, many thanks for your excellent work and for your genuine interest in us. Your sincerity means a great deal. It is delightfully refreshing." "B. and I want to thank you so much for all the many many things you did for us in Switzerland. You went far and above the call of duty and it made a very definite impression on us. We are so fortunate that we happened to find you. You absolutely made our trip in Switzerland so successful. We will also fly home feeling like we have a friend in Switzerland." "We had our first activities and plenary sessions on Saturday, and we met the entire group... small but cozy... that same evening we were scheduled to go on a walking tour of Lucerne... with Suzy, a wonderful Swiss guide who has a great sense of humor, excellent command of the language and a knowledge of history of the city that knocked your socks off." "I am so happy to have had this opportunity to meet you, Suzy, and explore Switzerland these past days with your guidance. You have been a wonderful source of information about this fabulous, beautiful country. I have appreciated your sharing of knowledge about so many facets of Swiss life including your own and that of your family. It has been very interesting indeed. Your bright cheery smile was a great bonus each day and who could forget the beautiful Strauss Waltzes while driving in Austria! Thank you so much." "Thanks so much for making our trip so enjoyable. We have enjoyed it so much and you do a marvelous job." "You have a wonderful talent for sharing your love of Switzerland and we are grateful to have been in your group. We appreciate your being so patient down to the very last mile and the very last day." "Your charm and enthusiasm helped to make my visit in Switzerland quite enjoyable. Your English is very good, and the way, you sometime turned a phrase, delightful. We may write a book of our travels and you will have your own chapter." "You are a wonderful guide! We enjoyed it so much. You have a zest for life and it was great to be on your bus. Thank you for sharing your country with us." "Thank you so very much for helping us in Switzerland. We will never forget you and the memories of finding the B. family and chapel. These will be passed down to further generations." "We loved Lucerne and you made our trip, plus the wonderful weather, good driver with his new bus and your beautiful country. We are telling all our friends to go to Switzerland and that we know "the best guide" . . . Suzy in Lucerne. If you decide to visit mid-west America, be sure to let us know!" "Thank you so much for making our trip so much more enjoyable. Your knowledge and humor really made our trip!" 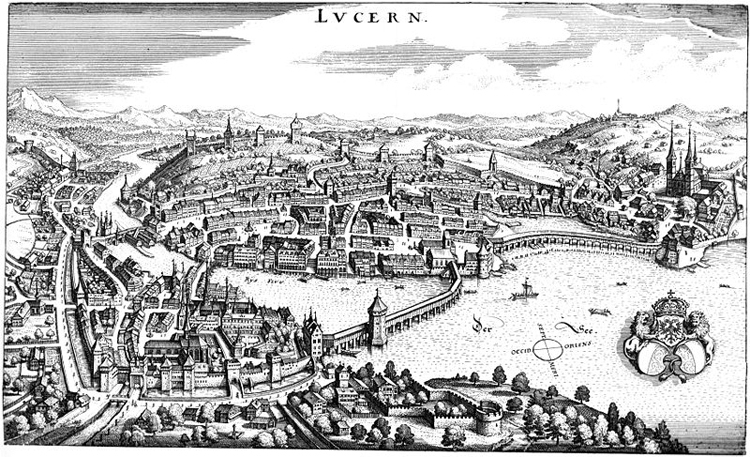 "You have made my sight-seeing in Lucerne such a wonderful and hard-to-forget experience. I'm really grateful for your kindness. Switzerland was a strange and unfamiliar country to me, but in that visit you've changed my views and feelings for a nation I know so little about." "We have read the letters of some of your grateful clients on the website, and we find it difficult to better the sincerity and abundance of their praise and thankfulness. We can therefore only say thank you for your loving care during our few days in Lucerne. You really made our stay in that beautiful country unforgettable. A special word of thanks for showing us parts of your country which we normally would never have experienced on a group-tour - also for relating to us lots of very interesting historical, archaeological and even theological information. We are indeed very grateful."